When we were out doing our weekly grocery shopping at what must be Orange County’s most hipster Ralph’s (on El Toro in Lake Forest – this place is what would happen if a Ralph’s mated with a Whole Foods, I kid you not), we came across something so odd, we had to try it – Bacon Popcorn. 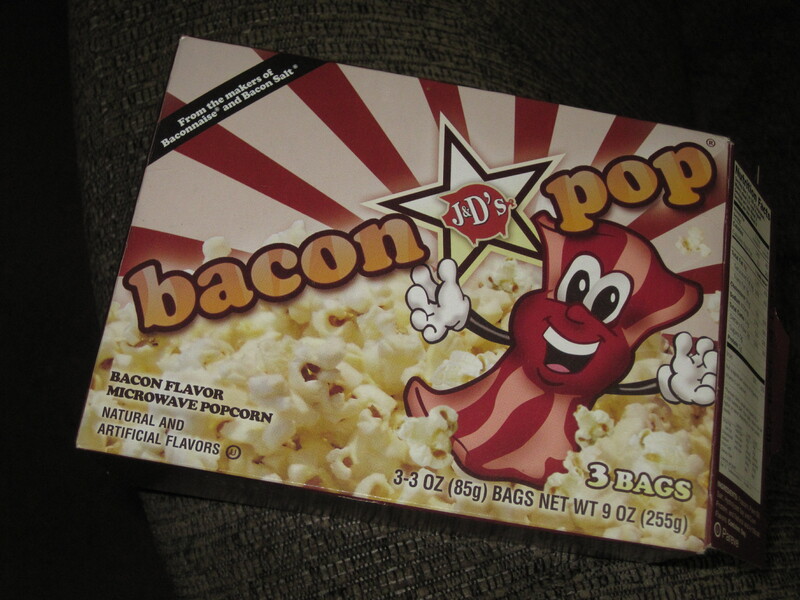 From the fried pork driven insane minds at J&D’s, the company that brought us Baconnaise and Bacon Salt, we now have BaconPop. Because if there was anything missing from my “free day” snacking bin (yes, we have such a thing), it was bacon flavored popcorn. So we stashed it away in there, almost forgot about it, then busted out this unholy snacking combination on Sunday. Now, in terms of scent profile, this stuff is nuts. Instead of filling the whole house with the usual smell of hot buttered popcorn, it did indeed smell like we were microwaving bacon for a late night BLT. Then we took it out of the microwave, cautiously optimistic at the results – in terms of sight, the stuff just looks like I took a bag of plain popping corn and smothered it in Bacon Salt. Not too scary so far. But the taste, well, the taste left something to be desired. Imagine, if you can, what it might taste like if instead of coating your freshly popped kernels with melted butter and table salt, you instead coated them in liquid bacon fat and Bacon Salt. Then, you might have some idea of what BaconPop tastes like. It’s one of those things that SOUNDS like it should taste good, in theory, if you really love bacon, but maybe doesn’t work so well in the execution. Or maybe I just consider the chew and crunch of freshly pan-fried smoked pork belly an essential part of the bacon experience. Maybe there is just too much cognitive dissonance in having the texture of popcorn in my mouth, but tasting bacon fat. Whatever the answer, BaconPop, you are not for us. You were an interesting one night experiment, but I think I’m going to go back to my Pirate’s Booty. kthxbai. I think they needed MOAR BACON, personally. For the record, their other product, Bacon Salt, is delish!